That said, yeah, I've heard the song.....to my ears it sounds like an obvious attempt to jump on the coattails of Smokey Robinson's Mickeys Monkey. Which is not to say that it's bad, or that i don't really really want a copy, just that it's somewhat derivative. As far as I know I've never heard Art Neville's My Dear Dearest Darling. But I have heard a similarly titled song which is quite different than My Dearest Darling.. I thought it worth mentioning as My Dear Dearest Darling was paired with Little Liza Jane. Maybe they were issued together because of the Clowns connection? btw, I posted Bo's, You're The Only One, just yesterday. In my opinion, a nice song that doesn't get played often enough. Very nice Dan! I wish someone would do a comp of the Cinderella material, if only to get some cleaner sound than some of my 45s. You are a jewel as usual. Thanks! This made my week ! Thanks, y'all! I'm still weeding out the typos and other oversights. But glad you find this stuff useful. Thanks, too, Ana for your information. In particular, your memory is spot on about Huey 'Piano' Smith and the Clowns recording a tune called "Dearest Darling". I looked it up, found it in my archives, and listened. And, yes, it was a doo-wop sorta thing with Marchan on lead vocal. 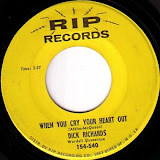 The song was the flipside of "Tu-Ber-Cu-Lucas and the Sinus Blues" on Ace 571. Also, I was not aware you had a blog, too, (not paying enough attention), but have now added it to my blogroll. Let me know if I can link to your post of "You're The Only One". Thanks. And, yo, Larry, the Cinderella catalog would fit nicely on one CD, or LP. Let's hope that comp happens some day some way. Great job as always, Dan (and, as always, thanks for mentioning Nevilletracks!) I’ve been wondering what the story was behind Cinderella Records for many years. I should have known that HOTG would be the place where my questions would be answered! I have all three of Art Neville’s Cinderella 45s, but have never been able to listen to them, so I can’t tell you anything about “My Dear Dearest Darling” other than the fact that Art Neville is listed on the label as the song’s composer. I second Larry’s thought (that some CD label needs to issue a collection of all of the Cinderella sides) but I can’t help wondering if the original tapes even exist any more. To my ears, it sounds like Rhino might have used vinyl as its source when it included Art’s “Lover of Love” on its Neville Brothers “Treacherous Too!” compilation. Keep up the good work, Dan. We never heard any of this stuff up here in Wisconsin. Keep taking us to school. Thanks, John. I incorporated some of your comments into the post the other night. 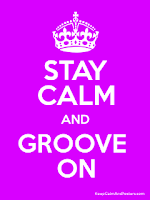 I am working on those Art Neville sides. . . . I continue to amend the post today as new info comes in, or pops back into my head, in some cases. Peter provided the label scan of Dynamics 1101 and in an email asked me about the date for that single, which led me to do some more web digging from which I came up with a date of around 1967 (which I will try to verify from another source), much later than the Gone version. Peter has also just provided more scans and some audio of other sides discussed. I will be checking those out soon. Again, stay tuned. And thank you, Peter, for keeping me extra busy! Man, I can't thank you enough for clearing up the Rip Records discog stuff...it's bad enough trying to find some records that *do* exist! 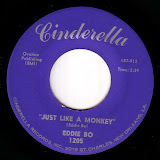 I have an MP3 of "Just Like a Monkey" (*not* the 45 itself, sadly), I'll dig it up tonight. Thanks, ID. Glad I've helped narrow your search! I got audio and scan of "Just Like A Monkey" soon after the post went up. I've got the scan posted and will try to get the song and amendments incorporated into the post. Man, this one has really been interactive! Me again. I've just updated the post with mp3 of "Just Like A Monkey", which, the more I listened, took on increasing significance in terms of ultimate Bo-consciousness, which I discuss. Hear/read it for yourself and decide. 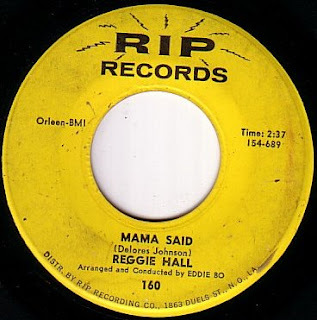 Just a note, too, about the Art Neville song "My Dear Dearest Darling", which was the B-side of his last two Cinderella 45s. Before hearing it, I wondered if it might be the same song as Bo's "My Dearest Darling". Ana suggested that it might be related to the Huey Smith & the Clowns song, "Dearest Darling". And she was RIGHT! What does she win? We have no prizes. So, she wins my worthless recognition for great guesswork, anyway. After getting the audio (thanks again, Peter!) and comparing Art's song to Smith's, I find that they have very similar chord structure, melody, and an almost identical first verse. As the Clowns version pre-dates Neville's by maybe 4 years, I would suggest that he "borrowed" heavily from the other tune. Not that it did him any good. That's showbiz. That reminds me, I need to update that part of the post, too. Will it ever end? 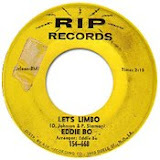 n.o.soul a go go has some e boes lost songs like" baby baby baby" joyce harris .there was another cd album nothern soul of the crescent city which has many of rare recordings listed at tunebags betty harris,willie t. wallace johnson,etc. and e- boes fun record is on that cd also dan thanks for your site! I heard that song a few weeks ago on a internet-radio, and i love it. I'll let you know more details in reply. And, don't worry, my English is not 100% either! Dan one omre thing, I have a kind of Guitar nerd question I realized that on several cuts presented in your feature, the sound of guitars is crispy and sound like "plugged directly on board" rather than plugged in a tube amp or something more greasy. Do you have any idea how the guitars were recorded there ? 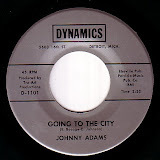 It's obvious for me in particular in the Johnny Adams "Going to the City"
A VERY late response to your question, jipes; but I don't think they plugged guitars directly into the boards in the mid-1960s. Everything was mic-ed as far as I know. Audio engineers, speak up now. Is it possible that At Last 1004 was to have been Drits and Dravy's "Talk That Talk?" The matrix numbers in the runout are "AL 1007" and "AL 1008." Good question - meaning I dunno! I don't have a copy of the Drits and Dravy 45 on Another, so I have never seen the runout, but will take your workd for it. With the "AL" before the numbers, it could very well be that the release was orginally meant for At Last. By the way, the R&B Indies show the matrix numbers (a/k/a Cosimo Code for that single to be 69-229/230. I think you should direct your question to the guys over at the Cosimo Code (link on my my left sidebar or just google) think tank. I don't see that they even have that single listed yet; but your info help them help you. I have a record in my modest collection that you don't? Wow. When I posted "Talk That Talk" on 45cat.com, I noticed the (very faint) "AL" matrix numbers and my reaction was "Hmmm..." It's indeed included in the Cosimo Code listings; see the 1961 block. The five At Last releases show matrix numbers similar to "Talk That Talk," but don't include 1007 or 1008. So was this meant for At Last? As the Magic Eight Ball would say, "Signs point to Yes."